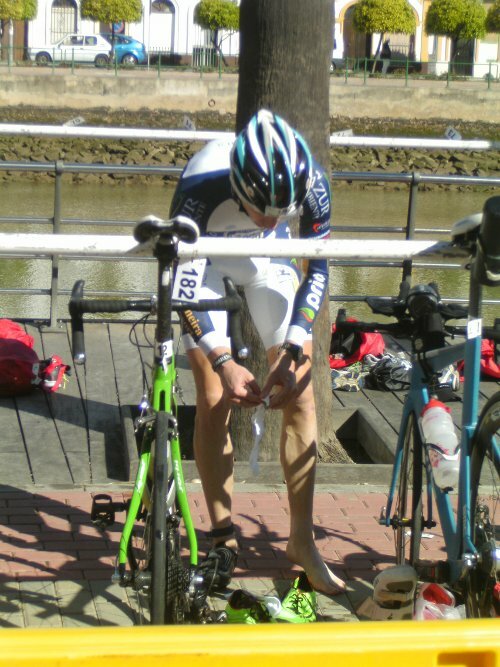 home | starting triathlon | My first triathlon (in 10 years). Iberman. My first triathlon (in 10 years). Iberman. there’s no killing the sports bug once you’ve got it! Back in January I was having a tough time coping with not being in competitive sport. While I’d meditated and prepared to leave cycling for a couple of years, I wasn’t quite prepared for the reality of leaving the sport and suffered for a few months. I would dream of cycling and be reminded of it and things that happened and places I’d been at every turn. I signed up to Iberman, a long distance triathlon early in the year to refocus me. I needed something to keep me from going mad. With business being slow through the winter and spring approaching my optimism was low. I never imagined making it to the start line of Iberman: Triathlon is an expensive sport. Obviously life’s necessities take precedence over our ‘hobbies’ however much we love and enjoy them. So basically I trained very little; it wasn’t self-sabotage: It’s impossible to dedicate a concerted effort to something unless we feel secure in life. I needed to work first. Two weeks ago I did a swim this past week a couple of sea swim and some short bike rides. I thought that there are plenty of weekend warriors who rock up and just do it, and I’d do the same. Me and Catarina rocked up not knowing what to expect. It was weird going to a race with my girl friend. For her it was a totally new and fun experience to be part of the race and not merely watching it. We dumped our stuff a nice little hotel called ‘Vila Formosa’ on the Portuguese side of the river and headed across to Spain to sign on. I was expecting problems: you know the type: “you need x, y and z insurance”, “we need your grandmother’s birth certificate”, “where is your medical certificate”, “ you need to buy this, that and the other” (or is that just in Portugal?). Funny side note: When I signed up to do triathlon the Portuguese anti-doping people wanted to put me on the biological passport. How many age groupers can claim having a biological passport heh? Insane. I was half expecting not be able to compete: I was a complete rookie with no licence and the bare minimum equipment. The process as it turned out was simple: Sign on, buy a day licence for €10 (insurance essentially), they hand you a bag of stuff and you’re done. Back on the Portuguese side we went to dinner a ‘rodizio de peixe’ was what we chose. I doubted the choice because the restaurant was completely empty on a Friday night and the price was too good to be true. It was too good to be true. Normally in a ‘Rodizio’ you are brought a variety of freshly cooked food till you are satisfied: In this case they gave us four little bits of old, over salted fish (this for two people). We waited and waited and no more fish was brought. I had had enough. This spoilt my weekend. I got up and asked for more fish, upon which the boss was called, upon which with complaints book was called. I said “Look, we asked for two ‘rodizios’ I want to pay for two rodizios, what you’ve served is one mixed grill. I want to leave this restaurant satisfied“. He replied “Oh we understood one rodizio for two people”. (this is a paradox since a rodizio is based on how much one person will eat. “Oh but of course we want you to leave satisfied!” This large overweight man said. “There isn’t a problem is there?!”. Catarina ran her mouth off at him (don’t mess with a Portuguese person and their food!) and we sat down again expecting a rodizio -by now we’d wasted nearly two hours in the place. What came was the old crap fish they served the first time (warm this time though) and another fish. Why would you treat people this way? It’s bizarre there are businesses that operate this way. I’m always regretful I can’t do more for my clients. You are warned: Only go ‘O Algarvio’ on the EN125 into Vila Real de Santo António if you want want to see a real life “Fawlty Towers”. In real life, it’s not funny at all; it’s actually very sad. The difference between road racing and long distance triathlon is that road racing is dynamic and long distance triathlon is steady state. Road racing is more fun and varied, but triathlon has it’s own beauty: I did feel ‘alive’ getting up at 4 in the morning to then throw myself of a boat into a large, dark river at 07:00 with the rain coming down. The swimming is phenomenal, a true adventure; avoiding being kicked in the face, wondering whether I was swimming in the right direction (more of a zig-zag it turns out). Is it peculiar I enjoy this sort of thing?! The bike was a bit of a disappointment. Out the water I passed loads of people and on the climbs whizzed passed fairly. I got a hypothermia about 20 km in, but luckily the weather changed it stopped raining and I was okay after that. The head wind was then the predominant problem: The long flat course and the fact I was using my road racing set-up with the only aero thing I had being the TT suit meant the the effort was ‘extra’ costly. I ground away into the headwind for 40 km And only lost a handful of minutes. Mighty impressive given the energy savings on a TT bike like rest had are significant… like up to 15%. I will definitely be fitting (at least) aerobars, and a 55 toothed chainring: I was spinning out along many sections of the return leg where the wind was behind me. That’s if my old cycling team won’t pay me some of the money they owe in the form of a TT bike. My bike speed was 35 kph, pretty shoddy by cyclist standard, but pretty good by weekend warrior standard. T2 (second transition) taking it easy… surprisingly my transitions weren’t too bad. The run was the big eye opener: I started great. No pain, quickly settled into a good rhythm; I even containing my enthusiasm a bit. I did the first 5km in 22’ including a toilet and shoe lace tying break. In fact I was only 8’ behind the leader at this point. I running far below my normal running speed, but I was happy with it. I wasn’t looking for more than that. Beyond the 10km the situation really changed: it was a peculiar mix of sensations, I felt fine, ‘the engine’ was in good shape, I hadn’t bonked (at least I wasn’t feeling dizzy or anything), but my legs simply would not obey. I backed off and off hoping I could find a comfortable pace but the legs were not responding. I stopped, walked a bit and felt all bow legged. I pondered the problem. My hamstrings felt great, in fact I could feel myself ‘bounding’ somewhat, my medial quadriceps was totally spent, my glutes too and my calf muscles were not the best. I figured it must be localized muscle fatigue from the lack of training. Anyway 62nd over all and about 30th before I ‘broke the chassis’ left me really chuffed. Nothing like a baptism of fire to get the ball rolling with something. Training -I’ve caught the bug and now I want more. I love this distance triathlon. Specifically bike training and running hard of the bike -get those muscles used to the situation. Lots of power work for the bike: It’s a 90 km TT after all. At least once a week a long fast run of a fast bike effort till the point of fatigue. (To prevent overuse by achieving the same effect with just a long run). Speed work to increase overall running capacity. Swimming: open water practice. I am not sure the pool is specific enough as open water is completely different. Race pace practice for swimming: When I train swimming usually I breath on every third stroke. As I a race it’s every second, the problem being that I start turning to one side (hence swimming in zigzag). Training will not be dissimilar to cycling, but in cycling short efforts are critical, here they are complementary and used to drag sustainable effort up a few notches. Nutrition is factor to look into: getting 360 Kcal in per hour is tough in triathlon. I think more liquids are necessary. Pacing strategy needs to be defined precisely before the even; knowing how much petrol is in the tank essentially. Pre race nutrition can’t just be a bowl of cereal. Dinner the day before needs to be decent. Possibly wide ranging dietary changes in everyday life: Need to read up. Lots of biking: My advantage on the bike will be big enough to compensate a so so swim and so so run. Tri bars (at the very least) for racing. Ideally: Disk wheel, deep section front wheel, 55 44 chainring, 175mm cranks, integrated handlebars (are they tri legal? ), aero helmet and lastly an aero frameset and forks. The problem is this stuff costs a fortune. And that’s it! I can’t wait for the next one!